The weekend just gone saw the first edition of Doom Over Edinburgh. The festival was curated by Miguel Santos, to bring together doom bands and fans for two days to help celebrate the UK's doom scene. 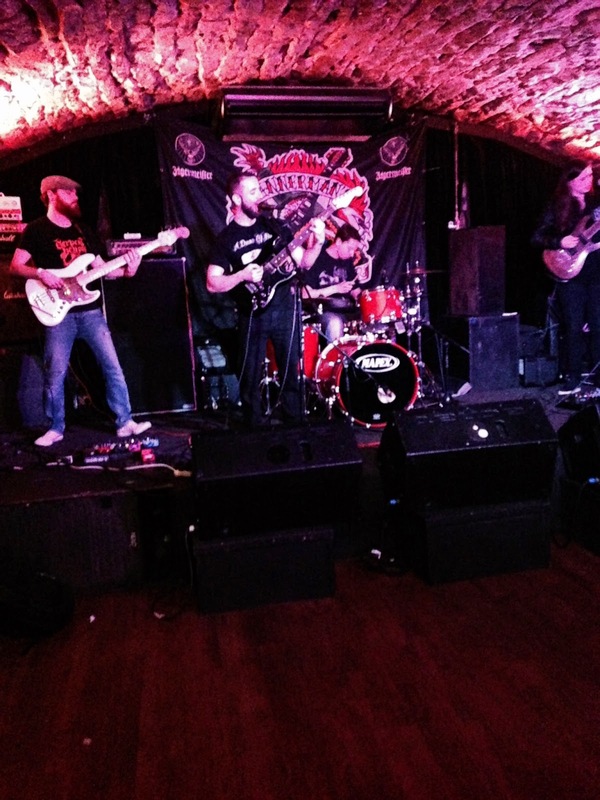 Held in the very suitable surroundings of Bannerman's, aptly situated in Edinburgh's old-town, it provided fans with an intimate setting in which to appreciate bone-shaking riffs and earth shattering bass. 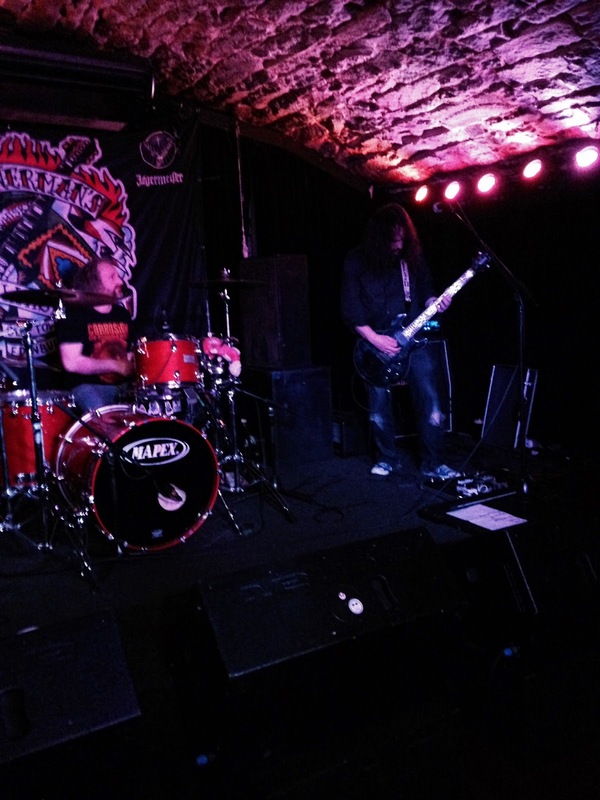 I made the trip across the border to immerse myself in the festivities, with the aim of not only checking out a fistful of bands I'd never seen live before but also to write my own live review, once the dust had settled. This is my attempt. There's also some photos from the first day that were taken using my phone, so apologies if they're not brilliant. After travelling up that morning and spending the afternoon taking in the sites and sounds of Edinburgh's historic centre, I made my way to Bannerman's for the evening to catch the first four bands of the weekend. 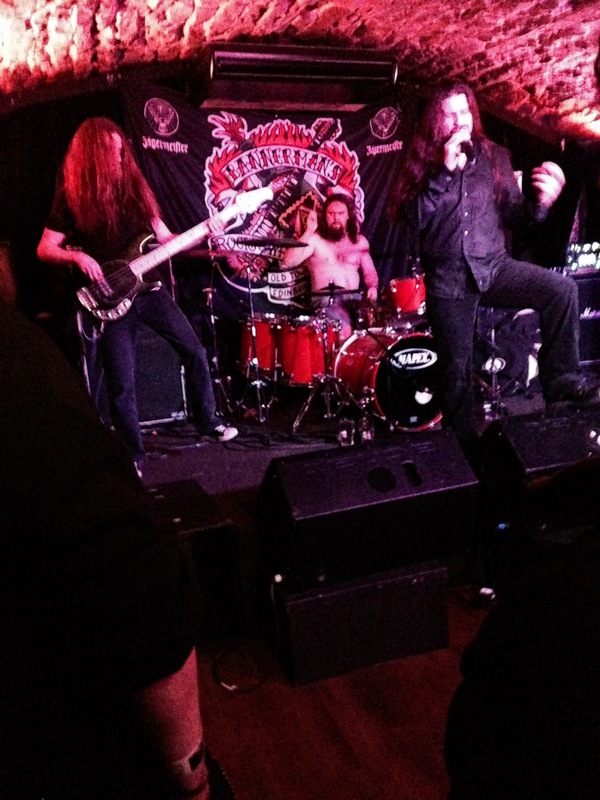 Unfortunately, Solstice were due to headline the evening but had to pull out for personal reasons, so in their place The Prophecy were elevated to the top spot on the bill. Local doom band In Absence opened the festival with some laid-back but progressive doom, which featured clean vocals and plenty of melody. The male/female vocals harmonies that were buried amongst the fuzz provided a great start. Next up was Glaswegian trio Aye-Aye, who provided groove-laden doom that picked the pace up slightly and got the crowd going pretty well. Amongst the songs in their set, "Procrastinate" was a heavy jewel to behold and got a fair few people vigorously nodding along. Ommadon were one of the very few bands on the bill that I had previously heard of and having bought their latest record from Dry Cough Records, I was eager to check them out. Comprising of just two members and mainly instrumental, the drums and lead-guitar were backed up by electronics that provided the bass. Unsurprisingly, they provided the heaviest set of the weekend so far. The evening's closing set from Yorkshire doom/death band The Prophecy proved why they were elevated to headliners. They had great stage presence and a really encompassing sound, which could only come from a band with their experience. 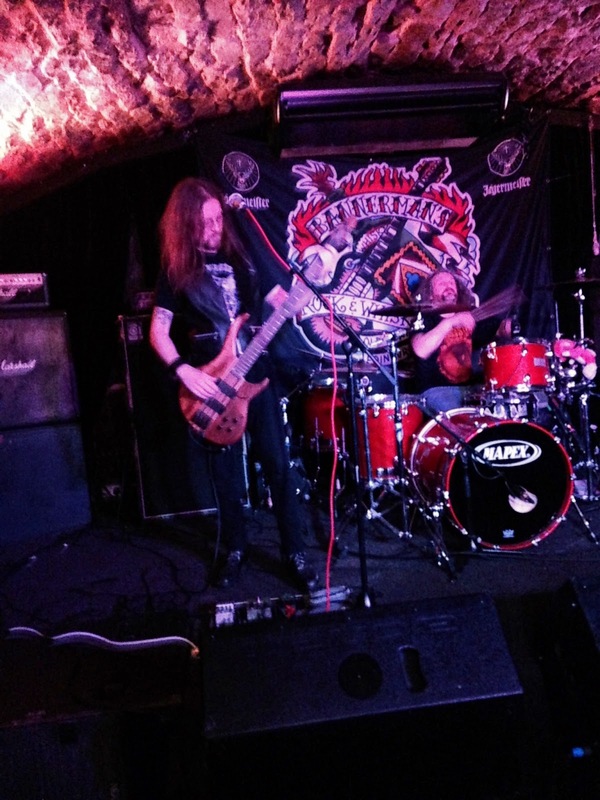 Bannerman's was the perfect setting for their melodic doom and they certainly put on a strong performance. The opening day was certainly varied and all four bands were great. I left feeling really fortunate to have witnessed all four bands and also slightly drunk. After a bit of sightseeing to try and clear my rather fuzzy head, I clambered back into Bannerman's for the second day. I didn't take any photos this time. Starting in mid-afternoon, there was a dedicated crowd gathering to watch opener's Pyre Of The Earth. The local-Glaswegian band put on an opening set full of occult doom, with captivating female vocals and a sound that was the heaviest of weekend so far. 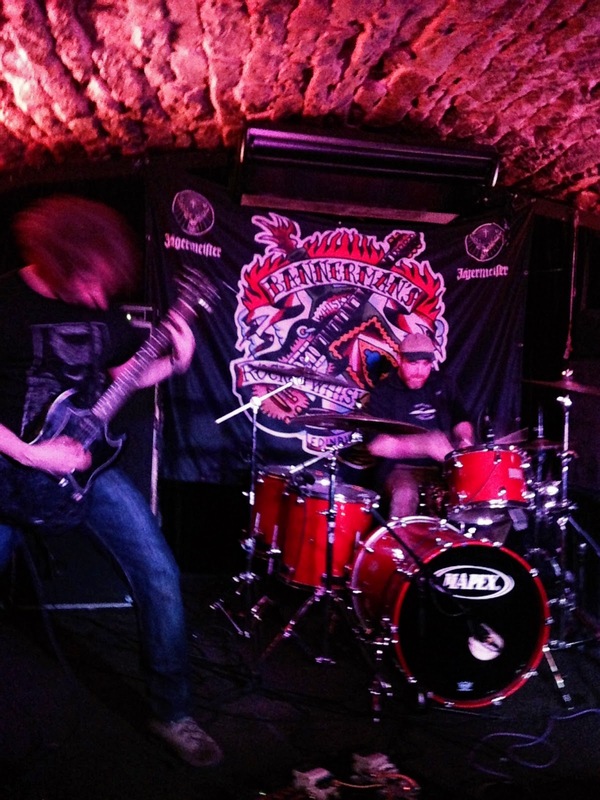 Edinburgh's Atragon were up next and were surprisingly energetic (for a doom band). They were heavy too and had plenty of local support in the crowd. Even from the bar, with the door to the room closed, they still managed to shake the venue. Following them came Of Spire & Throne. Another trio and with guitarist/vocalist Ali Lauder full of flu, they destroyed the venue. Following on from the release of Toll Of The Wound, they proved why they are held in such high-regard. Headless Kross took the prize for the best-dressed guitarists of the weekend and their intense, mainly instrumental noise was full of energy. Again, they proved that there was strong variation amongst the genre and were a great addition to the weekend. At this point, I have an admission to make. I was suffering and the weekend had taken it toll on me, so I took the decision around 8pm to go and rest and catch up on sleep, so missed Witch Charmer, Uncoffined and Iron Void. That didn't take away from what was a great weekend though and one that I hope will be repeated next year.